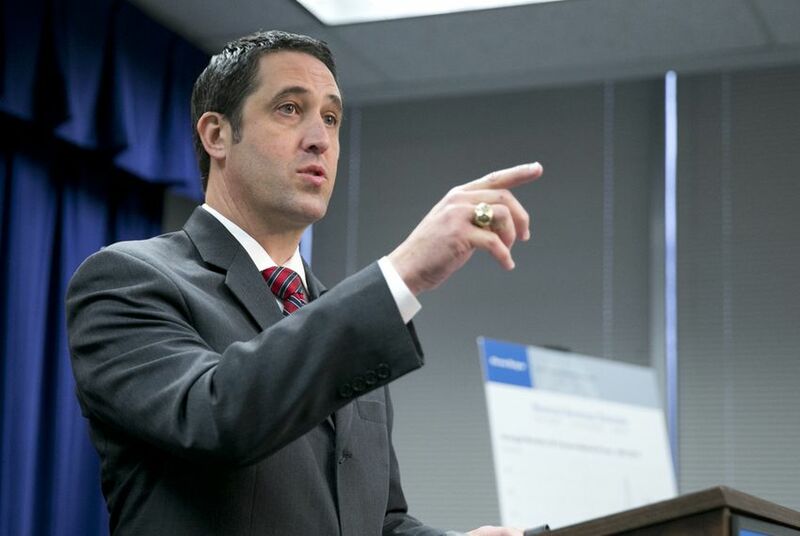 Comptroller Glenn Hegar, the state’s chief financial officer, wants to overhaul the way Texas socks away money for tough economic times. He’s pitching an investment strategy — the creation of an endowment of sorts — that he believes would grow the state’s savings account by billions over the decades and give lawmakers extra funds each session for often-neglected items such as funding pensions, paying down debts or fixing crumbling infrastructure like state hospitals. Hegar’s plan, made public in a TribTalk column Thursday, would reshape the state’s Economic Stabilization Fund, better known as the Rainy Day Fund. That $10.2 billion piggybank, expected to grow to $12 billion by 2019 if left untouched, is meant to help lawmakers plug budget gaps during times of low oil prices or other budget-crunching turmoil. By allowing his office to invest a portion of the money in higher-risk, higher-yielding options in the long term, Hegar says, the state would bolster its defenses against the next downturn and coax lawmakers to spend on important but easy-to-put-off projects. The call for the Rainy Day Fund reshuffling comes as lawmakers are squabbling along chamber lines over whether to tap it to balance this year’s tight budget. House lawmakers have proposed to use $2.5 billion of the fund, while the Senate's budget proposal would leave it untouched. Throughout most of its 28-year history, the Rainy Day Fund functioned little different than a stockpile of cash, which would slowly lose value over time due to inflation unless the state put more money in. A since-stalled oil and gas boom poured in billions of dollars in recent years, but the comptroller could do little to boost returns on those investments. In 2015, Gov. Greg Abbott signed legislation allowing Hegar’s office to put some of the fund's money in slightly higher-yielding investments, allowing the fund to at least keep pace with the dollar’s changing value. But even with that change, Hegar suggested Texas was still “riding a bicycle with training wheels” when it comes to managing its reserves. One tier — equal to 8 percent of state spending, about $8.5 billion during this budget cycle — would function essentially as the fund does now, yielding very small returns but walled off against risks. Lawmakers could vote to tap that fund if necessary, as they currently can. But any excess cash would flow into what Hegar calls a “Texas Legacy Fund,” a long-untouched endowment that would invest more aggressively, aiming for far higher returns over time. In good times, the endowment would disburse millions of dollars in returns that lawmakers could tap each session, but only to chip away at long-term needs. In one scenario the comptroller’s office mapped out, a $4 billion initial investment (assuming a distribution rate of rate of 3.5 percent) would send $805 million annually directly to lawmakers after 20 years — money they wouldn't otherwise see. Under that scenario, the legacy fund would be worth $25.6 billion in two decades. Hegar said he would like to see action on his plan soon — perhaps even this legislative session. 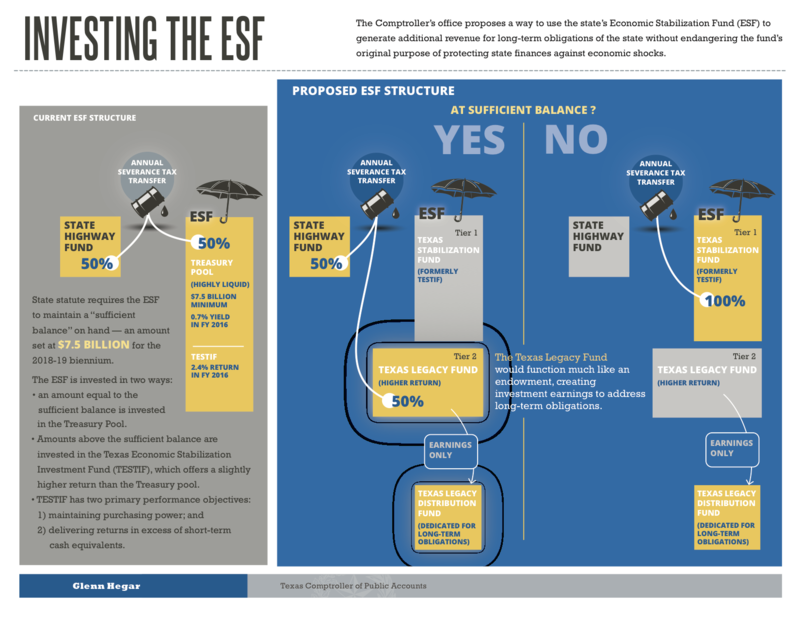 No one has authored legislation to overhaul the Rainy Day Fund precisely as he envisions, but Hegar pointed to several pending bills that could so with some alterations. That includes Rep. Giovanni Capriglione’s House Bill 855, which would expand the portion of Rainy Day Fund that could flow into slightly higher-yielding investments that keep up with inflation — an expansion of the change he helped push in 2015. The bill, which is set for a committee hearing Monday, would not create an endowment, but Capriglione supports the idea. Facing a shortage of cash, will Texas lawmakers tap the $10 billion piggybank known as the Rainy Day Fund? Two weeks after the Texas Senate unanimously approved its budget proposal, the chamber’s chief budget writer is asking Texas Attorney General Ken Paxton whether a $2.5 billion accounting trick it depends upon is constitutional.